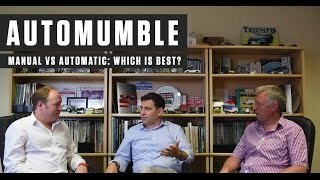 We sit down and discuss the pros & cons of manual and automatic transmissions, past present and future, with the team from Hagerty UK in their regular Automumble series. Would you admit to liking flappy-paddle gearboxes? As part of classic car insurance specialist Hagerty’s regular Automumble series, we discuss which is better – manual or auto – and discuss the driving outlook for the classic car enthusiasts of the future. For the team, manual is a clear winner in the fun stakes when it comes to driving a sports car, but given the increasingly small numer of high-end sports cars that even have the option of a manual transmission, is it realistic to expect the drivers of the future to want to drive manual classics – or the cars that will be classic then? Or will they still enjoy the thrill of a totally different driving experience as owners of pre-war cars still do today? Watch the video to find out what they thought.